Oscar Robertson was one of those legends who put up monster numbers on a regular level. As a point guard playing in a league focused around big men, he broke records left, right and centre. He put up a triple double average in 1962, becoming the first player to do so. He nearly averaged a career stat of 25.7 points per game, 7.5 rebounds per game and 9.7 assists per game. Russell Westbrook is the closest thing we have to Robertson's stats. The man averaged a triple-double stat line over the course of a season, broke the record for most triple-doubles in a season (42), won MVP and then turned around and did it again. Westbrook has the drive to do stuff that's considered impossible. He has the only 50-point triple-double in a playoffs. He has also recorded the most 50-point triple-doubles in a season. The man is 6'3 and grabs double digit rebounds regularly. There's no one that can do the sort of stuff he can do. Armed with a shaky jumper and explosive athleticism, Westbrook is the ultimate team carrier. Teammates are an accessory to the Westbrookian philosophy, and his usage rate is an extreme number. The man has the ball in his hands more than Kobe Bryant. It's an odd fact, but triple-doubles have been many things. Maybe they're irrelevant, excessively worshipped, stat-padding techniques. But whichever way people put it, everyone agrees they have never been as normal as they are for Westbrook. This is the Westbrook experience; he'll average a ton of assists, grab a bunch of rebounds and still score a lot. But somehow he'll be lacking in some statistic that can't be quantified, like defensive impact, or moving the ball around effectively. 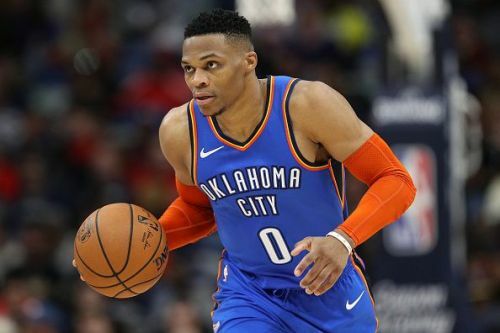 Westbrook's most glaring weakness would be off-the-ball movement on defense. His offense is very good, but he frequently gets lost on screens, and falls asleep in the paint far too often. Nevertheless, he's the NBA's best bet to break that particular record at 110 triple-doubles right now. Show Me The Money: Just Why Do US College Athletes Remain Unpaid Despite League Body Generating Billions?